Want to make a change in yourself, or in the world around you? Tired of trying to do everything on your own, without any meaningful support? Ready to say goodbye to procrastination, and live the life you've always wanted? Butterfly Soup is the solution you've been looking for. A framework that facilitates transformation. A practice that promotes a sense of hope and happiness. A methodology that helps you maintain motivation. Drawing from a wide range of disciplines, Butterfly Soup provides a fresh perspective on how you can make the most of life in the 21st century, and become the person you've always dreamed of being. If you want to move from I want to I have, Butterfly Soup products and services can get you well on your way. You will be equipped with the tools, resources, and insight you need to live the success you've dreamed of! Resistance to change is a natural part of the process! Change is intrinsic to our experience as humans, but sometimes it can be really hard to navigate. When we’re lost in a fog of too many options, or when we’re crippled from the emotional hardship of life's challenges, often we feel mired and unable to move forward. I call periods like this “being in the soup.” When a caterpillar is in the process of becoming a butterfly, inside its chrysalis it literally dissolves into a "soup". It’s no longer a caterpillar, and it definitely hasn't become a butterfly, it's somewhere in between. Interestingly, this soup is made of something called imaginal cells, as though the caterpillar has to imagine its way into becoming a butterfly. It’s really common to feel trapped in the stage where you’re no longer what you have been, but aren’t yet what you’re becoming. It's also common to feel hopeless about what's going on in the world around us or within us, and to feel like there's nothing we can do about it. Most of us weren’t given tools to troubleshoot our psyches. This is why it’s so important to have a strong support system, people who have a different or broader perspective, and can guide you through. If you’re “in the soup,” or if a significant transformative shift in your life sounds like something you want to explore, I can help. Wherever you are in your process, our time together will include the mindfulness training, holistic thinking, and resistance awareness that promotes true transformation. A lot of us have a sense that something isn’t right, or that something needs to change in our lives, but we have no idea where to begin. Fortunately, you don’t have to go through it alone. I give you plenty of support and guidance to help you clarify which aspect(s) of your life need to be transformed, and how to make the change. Sometimes knowing what you want isn’t enough; we’ve all needed accountability now and again. You’ll get a step-by-step plan that outlines how to get from where you are now to where you want to end up, with regular support to ensure you’re sticking to it—and tips and tricks to help keep you moving forward. If you know what you want, and you know what it will take to get it, but you’re still not there, you’re not alone. There are many kinds of resistance, both internal and external, that can keep us from our goals. 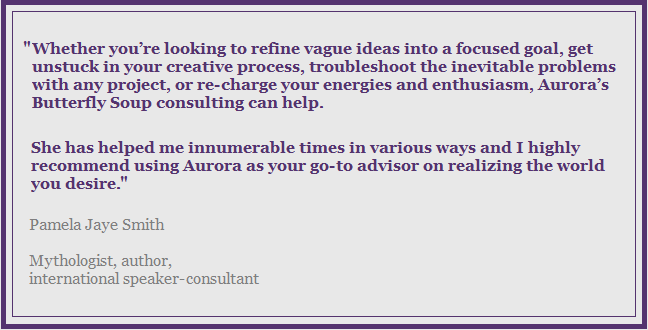 I help you troubleshoot your process and plan, so you can leap the hurdles you’ve encountered and get back on track to completion. Sometimes we know exactly what the problem is, but for the life of us we can’t figure out what to do about it, or we feel trapped. You and I will work together to figure out how you can regain control over your trajectory, and finally experience the transformation your heart is longing for. We'll start with a free 30 minute consultation which will include discussing the pricing option that will meet your needs. A sliding scale is available to people in marginalized social groups (POC, LGBTQIA, low wage earners). If you have any questions, please feel free to ask. Whether the members of your group need to progress toward goals separately or as a team, Butterfly Soup offers a functional modality that will help your organization identify pain points more effectively and apply transformational principles to drive your team forward to success. Mindfulness training can have a remarkable impact on organizational culture, providing a marked increase in members' happiness and productivity. Contact for pricing or additional information. I’d always had a burning curiosity to understand the how’s and why’s of the world, which led to a self-guided education in psychology, anthropology, political science, economics, literature, metaphysics, and systems theory. I regularly considered going back to school for an advanced degree, but it seems to me that in this modern age of advanced technology and declining academic standards, a formal education is less effective and less meaningful than it has been in generations past. Instead, I focused my attention on understanding how all of the elements I was learning about intersected and informed one another, developing a holographic framework to better make sense of our cultural trajectory and my place in it. One day I realized I’d had all the jobs that I wanted, in all of the industries that fueled my passion. I’d produced television, designed video games, consulted for startups, managed corporate compliance, had a brief stint in publishing, even slung cocktails behind a bar. I’d also seen what worked, and what didn’t, as people moved through their lives and careers. I’d paid attention to who was able to achieve success, and who seemed to flounder, and I’d seen a series of patterns emerging. So I decided to turn my attention to helping others experience the same joy and success that I had attained, and put those observations to better use. I’ve helped people with a wide variety of challenges and goals, from figuring out how to start a business or change the way their business functions, to finding the courage to start (or stop) a romantic relationship. Finding a dream job that will bring true fulfillment, finishing an artistic project that has lingered for months or years, even just finding a way to feel OK and find hope in this world of uncertainty. I’d love the chance to help you, too! These supplemental materials will help you overcome procrastination, manage your transformative process, and manifest your dream! The physical, paperback version that you can carry with you everywhere you go! This manual outlines the transformative process, with tips and tricks to help you be successful as you work toward your goals and finally become the you you've always wanted to be! Prefer digital? No problem! The Kindle edition is available through Amazon. coming soon... butterfly soup workbook! Once you understand the basic process laid out in the handbook, these exercises will help you kickstart your transformation and keep you on track through all five stages! You might call it luck, or serendipity, or even a miracle, but most great successes have a coalescing moment, a conversation, an event that moves them from "I want" to "I have". Tips and tricks for coping with the doom and gloom of "what if" scenarios. Hope doesn't always spring eternal, sometimes it needs a little help. Here are some techniques to combat the pervasiveness of hopelessness, so that you can pull yourself back up and keep moving forward! What do you do when you're presented with a ton of options and you can't decide what's best? Or worse, when it's a binary option of either yes or no, and you have no way of knowing which option will bring you happiness? How did you hear about Butterfly Soup?